Slay: Change into Saint Jiub, Eradicator of the Winged Menace. 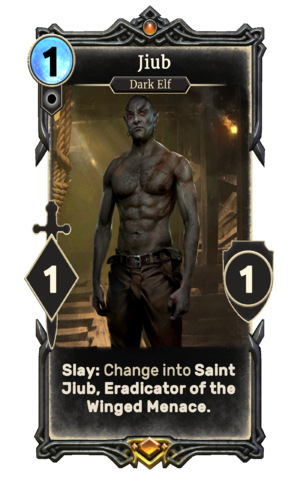 Jiub is a unique legendary Neutral creature card. It is part of the Houses of Morrowind expansion. Jiub first appeared in Morrowind. He also reappeared in Skyrim's Dawnguard add-on. This page was last modified on 2 March 2019, at 00:56.